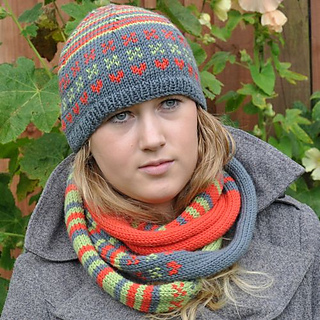 Bessie May fun and bright, three colour way jacquard and striped Heart Beanie, with matching Spaghetti Infinity Scarf. Wind the scarf around four times like a chunky necklace, or wear long, to brighten up any outfit. 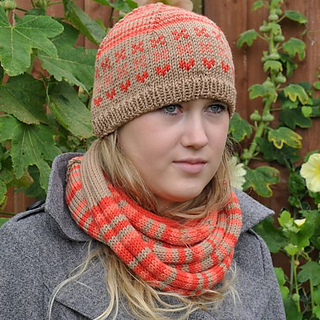 Heart Beanie is knitted in the round, with simple intarsia for the hearts and stripes to emphasis them. 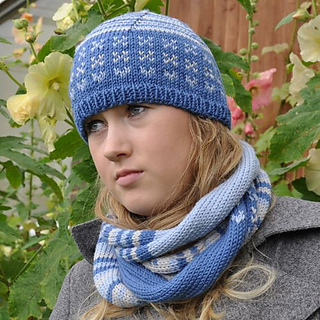 The Spaghetti Scarf is a replica of the hat design, but in three pattern repeats, with changing colour way, so you get great colour definition when worn.